At the end of the day, productivity and speed don’t mean anything without quality results. On the other hand, spending too much time achieving an exceptional finish can cut into your profits. The full circle sanding system was designed by professionals who understand that building your business depends on moving quickly, without sacrificing results. The Power Pad attaches to Porter Cable 7800 and Flex power sander models, as well as our level 360 sanding discs. The Radius 360° Sands large surface areas effortlessly, with no flipping or skipping! The Patented Trigon180° replaceable pad and bumper all in one. 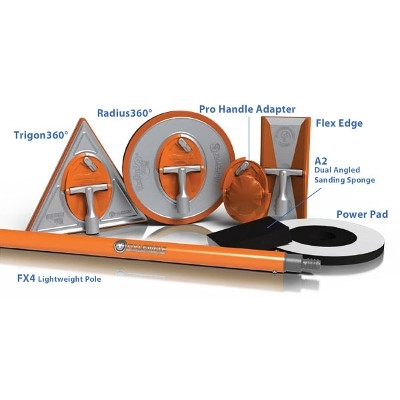 Flex Edge Perfect for corners, angles, and more, with versatile, changeable abrasives for a multiple applications. The A2 Sanding Sponge finishes off tight corners with this unique, durable 75 degree angle sponge. The FX4 4ft Fixed Length Pole. Strong and super light weight; only 13 ounces!